You know how a dog begins to whimper and wiggle as it nears home after a long car ride? I could identify with that as my husband, Charlie Brown, and I boarded a ferry from Tsawwassen, British Columbia, to Duke Point on Vancouver Island. Although we live in central Oregon, we had kept our trawler in nearby Sidney for six years, and the island feels like home to me. This time we were headed to Ladysmith to meet Bill Rathlef, a retired electrical contractor, and his wife, Loretta Zink, members (and co-secretaries) of the Westcoast Work Boat Association (WWBA). Bill and Loretta had invited us to spend a night in their handsome log home on Sibell Bay. It was "prep night" for me before attending the association&apos;s rendezvous in Cowichan Bay, a few boat hours south of us. Rendezvous aren&apos;t new to me, but I was soon to find out this one had about as much in common with ones I had previously attended as opera does with bluegrass. For me, the experience was called getting an education. It also was called meeting genuine people, real boaters, ones from whom electricians, diesel mechanics, or marine repairmen won&apos;t get rich, because these owners mostly do their own work and know how to do it well. Their boats often are works in progress, and the owners are just fine with that. They don&apos;t need fancy, or expensive, or "goochy" as Bill loves to say. (Not Gucci, but there are similarities in connotation.) A few extra layers of paint or labored wear add to the dignity, and don&apos;t think these historic boats don&apos;t have plenty of that. Friends of our hosts, laid-back and likeable Denny Bohmer and Sue Marlatt, join us for an evening of boatspeak. 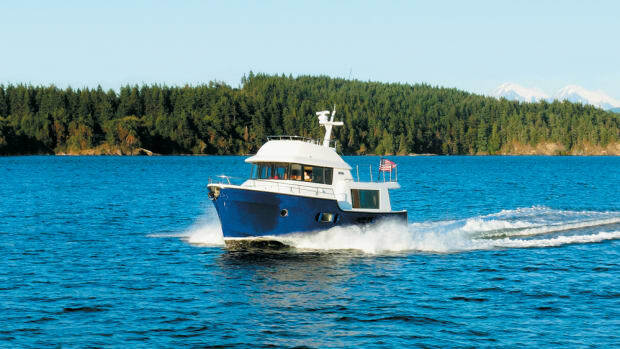 Denny and Sue&apos;s 42-foot workboat, Alaskan, looks like a picture, lazily at anchor in the bay just off the porch. She&apos;s a steady-as-she-goes salty looker with a 12-1/2-foot beam and 6-1/2-foot draft. Denny has had a number of boats and is one of those guys who can build or fix anything. Sue, too, is savvy about boats, with commercial fishing and sailing instruction in her background. Alaskan has had four other owners, two of whom about did her in. Once, a load of slippery herring (not balanced with pen boards) shifted and rolled the boat. The captain walked out and right onto the keel. She was righted, the herring were saved, and insurance bought a needed new engine. Another owner rolled her his first time out on the Strait of Georgia. Salvage took her, which was just fine with that captain. Over wine and an informal chat, I asked how one goes about purchasing a former working boat. It&apos;s no secret there&apos;s been a cutback in fishing, with the government buying up licenses, and boats up for sale. My hosts offered their story. "When Bill and I were dating, Lady Allysha was sitting at a marina, and I really liked her looks," says Loretta. She was covered in shells and seagull droppings, and it was obvious no one was using her, so they stuck a note in her door saying, "If you&apos;re interested in selling this boat, please call." It didn&apos;t take long. The 2000 economy wasn&apos;t booming, and the out-ofwork owner was eager to sell. He asked $15,000. Bill didn&apos;t quibble; he put out the cash and he had himself a boat. "When I bought Lady Allysha, I bought her on first impression. The boat looked so cool!" says Bill. He liked her exposed hardwoods and obvious toughness. There was already a current survey and a whole pile of shipyard invoices showing her owner had done most of the dirty work, including de-rigging. 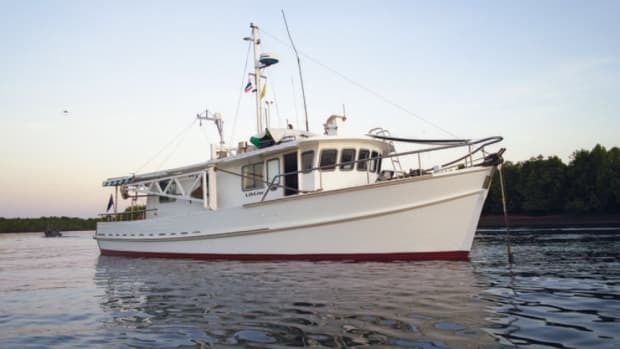 In her former life, she had been a classic gill-netter on the Fraser River, and later was converted to a troller for fishing the coast of British Columbia. "The step Bill and Loretta did right was put a note on the door," says Denny. "There&apos;s a lot of owners out there hemming and hawing around, thinking about selling their boat, and sometimes all they need is a little prod." If a boat looks neglected, it&apos;s a promising sign. But determining the buyer&apos;s criteria comes first. "For me, she had to be a pretty boat and well built," says Sue. Other things didn&apos;t matter so much. Some buyers want sparkle and shine, with nothing left to do. Not Sue and Denny. Look at lots of boats; walk the docks. Note what layout holds appeal. "We looked at one where her forward upper bunk had been converted to a bathtub," says Sue. "How would you get in and out?" But it worked for someone. Once one finds a boat that latches on and won&apos;t let go, get a survey. What&apos;s to watch out for that may be different than when buying a normal pleasure boat? The no. 1 thing is hidden freshwater rot. "Paint and gumbo can hide a lot of nasty things," says Sue. This group knows the reason they&apos;re called workboats: One could work on them all the time. "It&apos;s really good if you bring along some kind of skill," says Denny. "Woodworking. Mechanical. Experience with building." As an owner of one of these boats, one must be vigilant about maintenance. It&apos;s not uncommon to burn or scrape old paint off every year and repaint, including hauling out to add a coating of copper bottom paint. Fresh water entering anywhere is the enemy. "It&apos;s kind of spooky how wooden boats are shifting all the time," says Denny. They have to be caulked. Corking wears out. In open seas they will work more than if they&apos;re in inland waters. "Inland, they may not need touching for 30 years...unless they get some contaminant in them that causes rot." There are a lot of hundred-yearold hulls out there. Repair and maintenance abilities are especially important if the buyer is on a budget. "If you can do it and enjoy doing it, you&apos;ll get a lot of boat for cheap," says Sue. Denny recommends that buyers get expert advice before tackling problems. "For instance, a lot of these old boats have bleeders [rusty nails] that will need to be replaced," he says. Electrically, most have been modified many times and wires often just cut off, which means tracing everything. "You have to have a tolerant personality to own a workboat," adds Loretta. With refits, Bill warns of going too far. "If you want to spend a million dollars on a boat worth a few thousand, well, then, do it," he says. "But if you want to have fun..."
The essence of this last phrase would come to light many times in the following days. I wondered about safety and ease, particularly for children, elders, or the infirm, of getting around on boats designed to be utilitarian. Not a problem, they all agreed. Some have rails, some don&apos;t; but stability makes the difference. Netting can be put around the deck to make a boat kid friendly. "It keeps you young," Bill says. Then there&apos;s an odd space (not odd to a fisherman, of course) called the hold. Some fishholds were built from wood instead of fiberglass, and painted with a shiny silvery paint that was inspected every year by hold inspectors. Many holds are fiberglass over wood, and here debate begins. Should fiberglass be removed to let wood breathe? Maybe yes, maybe no. "We lived in our fishhold for a couple of years," says Denny. "It was like a big tub enclosure, 12 by 14, with pristine fiberglass." They had a queen-sized foam mattress down there with an electric blanket. There was even a closet. But when they&apos;d unscrew a light bulb, a nasty smell would leak out. Some fiberglass holds were built well, some not, which is a concern that needs to be addressed case by case. If retained and used for storage, some owners put washer/dryers or freezers in the hold, or basement-type things. Some make another stateroom. Some call it their wine cellar, with good reason. Definitely worth a look are the former fisheries boats, built for the government, well maintained, and with accommodations built in from day one. Their regular maintenance is key when comparing them to a fisherman&apos;s boat. The fisherman works off an annual cycle that includes letting the boat sit for 7-10 months, getting her ready for a month, then going out for one or two months. "When he&apos;s out and has a breakdown, he can&apos;t afford the time to fix her correctly, so it&apos;s bubble gum and baling wire. And if the repair still holds at the end of the season, well, why fix it?" says Denny. Advantages of wooden boats over steel are that they&apos;re quiet, they don&apos;t sweat, and they&apos;re seakindly. Steel boats are robust and rugged and aren&apos;t bothered by marine borers or as likely to experience ice damage. A workboat&apos;s purchase price can be a tenth that of a pleasure boat, and the savings don&apos;t end there. Maintenance and repairs usually are much less. Watch those fiberglass pleasure boats at the gas docks, and the difference becomes even more apparent. "We don&apos;t use 500 dollars&apos; worth of fuel in a year," says Bill, perhaps thinking of a go-fast buddy who can use nearly that much from one stop to the next. Stories continued to pop up like the cork in another wine bottle as we were called to a dinner of steaming salmon. A theme emerged: a certain pride the owners have for these boats. One anecdote summed it up. An 84-year-old fisherman had no intention of ever going to sea again, and his boat sat in her frame for a long time, the license having been transferred to another. Yet the man was seen out with his bucket of paint, brushing a new coat on his old boat. When asked why, he quietly said, "You don&apos;t bury your mother in an old dress, do you? The next morning, Loretta wanted to drive our car south, giving Charlie an opportunity to jump aboard with Bill and me for the cruise south on Lady Allysha. No prodding needed there. Lady Allysha lounged in her slip at Page Point Marina, framed by a touch of morning fog. Spots of sunshine showed we were in for a sumptuous day. As I stepped aboard, I remembered that Bill and Loretta were married on this deck in 2003. Lady Allysha is close to 35 feet, with a 10-foot beam and a draft of 4 feet 9 inches. There was nothing goochy about her, and Bill offered no apologies for spots of peeling paint or yesteryear wear she so proudly wore. Lady Allysha was built at Nakade Boat Works in Steveston, B.C., for $3,400 in 1957. (Her Japanese builder, who had worked in a shipyard before being interned during WWII, opened a yard when he was released from the camp after the war.) She is built with cedar planking over 1-foot-by-2-1/2-inch bent oak frames on 10-inch centers. The decking and top of the wheelhouse are sheathed in fiberglass. The hull sides are fitted with gumwood, originally for ice protection when she was used as a Fraser River gillnetter. The unusual cabin door had to have a story. A friend found the frame lying in the mud off one of the nearby islands. Bill is convinced it came from Robert Kerr, a ship that sank in 1911. Being gumwood, it wouldn&apos;t float, so he thinks it must have washed in attached to planking that would. In the door&apos;s center is a Cowichan Indian carving. We glazed through calm waters at 7.5 knots and 1800 rpm, hardly leaving a wake. I had been told a workboat&apos;s diesel smell takes some getting used to, but it wasn&apos;t even apparent. I did notice how low Lady Allysha sat in the water. As someone used to much higher boats, this oneness, deck to water, felt right to me. Bill&apos;s dalmatian, Tonya, rested her head on my knee while I listened to the click, clicking as the autopilot made its adjustments. Underneath the table is Tonya&apos;s spot for traveling. Bill promotes her as an ol&apos; sea dog, with a green eye to starboard and a red to port. Hmmm. We could move about Lady Allysha with ease, and there was even enough cabin headroom to accommodate my 6-foot-5-inch husband...as long as we both remembered to duck when we went out on deck...and not step in Tonya&apos;s water bowl. Partway south, we watched prawners hauling up their traps, pulling and pulling by hand. A Canadian fisheries plane swooped low and buzzed by Lady Allysha, the pilot counting floats as he circled the shrimp boats. Bill and Loretta cruise year round in an area where not many boats are out in the off season. The small, 12-volt fridge and one-burner diesel stove suit their needs, supplemented with a barbecue on deck. The helm seat drops down to make seating for four at the table behind. As we rounded the corner and headed into Cowichan Bay, or Cow Bay, as it is known, I could sense the flavor of the rendezvous. We slipped into line with several other workboats chugging along in the same direction, all salty boats with similar lines and histories. I&apos;d heard that their single engines aren&apos;t easily maneuverable, but as we pulled into a tight slip at the marina, Lady Allysha smoothed in like she owned the space. Perhaps it was because Capt. Bill was the 1971 champion bathtub racer on a Nanaimo-to-Vancouver route. When one can handle a bathtub, an old gillnetter/ troller is a snap. But this docking included an unexpected snap. With Bill at the on-deck helm station, a cast lever cracked, and a setscrew popped out of the shift lever. Bill retreated to the main helm, and it became a non-event. In a prepared group like this one, finding someone with the right size replacement was...well, a snap. At rendezvous I&apos;ve attended, everything is polished, vacuumed, varnished, shampooed, and conditioned. There&apos;s never a mucky fender in sight. Here, as workboats nosed in, I saw paint curling, loose gear, and rust lines meandering down hulls. Not much time or water was wasted hosing down decks. The boat owners weren&apos;t here to waste time cleaning fenders when they could be enjoying each other&apos;s company, learning a new repair method, or bending an elbow. That&apos;s not to say I never saw brass that reflected a face or fresh, shiny paint. I did. Miss K.C. and Petrel (see the sidebars) were two Bristol-fashion examples among several. At other rendezvous, I see folks outfitted in colorful nautical tops and expensive, sharply creased pants. Not here. T-shirts and jeans work just fine. "Did you bring some casual clothes, I hope?" Loretta had asked diplomatically when I showed up at her home dressed a bit too professionally. Of course I did; after all, I would be climbing on boats. But I soon found out that one not only climbs about on these boats, but climbs in, out, over, down into fishholds, up steep ladders, and through construction projects. I had no problem with any of that. A little disarray, an obstacle, or good clean dirt with history never hurt anyone. (OK, one rafted boat was spaced a little too far away for my gracefulness level.) But after a day of owners educating this workboat neophyte, I wasn&apos;t about to admit I had brought white jeans. Believe me, they never left their hanger. WWBA was formed by and for workboat enthusiasts who convert ex-workboats to cruisers and liveaboards. 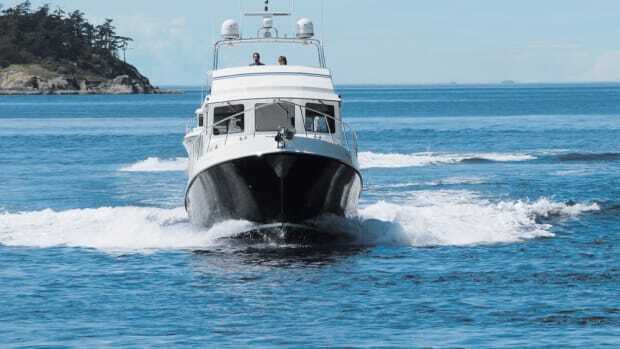 It&apos;s a group of enthusiasts who own, or are interested in purchasing, a workboat for pleasure cruising. Go to a meet, and one will see former trollers, gill-netters, seiners, tugboats, forestry boats, and maybe even a ferry. Terry Hill, aboard Eagle Rock, is the "father" of WWBA. Six years ago, after purchasing his workboat and spending two years cleaning, repairing, and painting her, he and his brother took a two-month cruise. They were surprised to meet others who were doing the same thing with ex-workboats. Their first gathering brought in 15 boats. They now have 87 members, most based in the Gulf Islands of British Columbia. Their stated purpose is to exchange ideas and information, and at their meets they often have experts to advise and run a seminar or two. Preserving skills and older technology is paramount. But don&apos;t discount the eat, drink, and be merry factor. Nobody here needs to apologize for being the last to leave the party. Cowichan fit perfectly as the host town. Fish and chips, used books, two liquor stores within a block, and proper working-man pubs. No wheat grass or $30 stacked dinners, although there is a good organic bakery. The harbormaster said the town was about to welcome its fourth or fifth movie filming, this time for The Mermaid Chair. I&apos;d just read the book, which seemed a bit goochy for this town. At the first morning&apos;s seminar, a bunch of us stood on a once-sturdy workboat as the heavens opened up and let loose upon us. The shipwright lecturer from Cowichan Bay Maritime Centre began with, "Let&apos;s look at a rotten boat." His well-soiled jacket convinced me he was the real thing, not afraid to get down and dirty to examine any situation. His huge German shepherd, Karl, sat 10 feet away, leaning toward him, staring intently, and listening as ardently as the rest of us. Two things kill a wooden boat: dead air space and fresh water. We had plenty of the latter hitting the deck as the shipwright spoke. If one doesn&apos;t keep up annual maintenance on a wooden boat, it takes longer to rectify problems than with fiberglass. The shipwright also recommended salting the decks when preparing wood for winter or when a boat&apos;s not in use, especially where water pools. The first place he looks for rot is at the base of outrigger poles, because that&apos;s where there&apos;s movement. Constant flexing is why rot happens so easily: Fresh water gets in seams and cracks. We learned that dry rot cannot occur on wood underwater. It occurs when wood is out of the water and usually is seen in unvented areas (where there is dead air). Our expert recounted hearing surveyors say that checks in wood were dry rot, making it unsound, when that wood had never been out of the water. Not correct, he told us. The lecturer said the type of wood used to build a boat isn&apos;t that important to him. More important is what is accessible at the right price. He prefers using oil rather than varnish, because of flexing. These boats are built to last many years at sea, where they are always working. So care for them well, and they will do their job. His last piece of advice: S-1 epoxy sealer is a marvel to seal surfaces, but be aware that it doesn&apos;t work on wet wood. After being around this group, I&apos;ll admit to feeling like a wimp-the one who couldn&apos;t handle late hours or keep up with flowing hops and grapes. At a potluck dinner on the final evening, WWBA President Al Helmersen, aboard Smaller One, presided over a business meeting, declaring a great time was had by all. I had no doubt it was true. The group voted to return to Cowichan in 2007 and presented me with a snazzy, but not goochy, WWBA fleece vest, which I wear often. Its logo catches attention and draws questions, usually followed by "Cool!" Throughout these few days, I had learned a lot. I had thought boat designers/builders always came with familiar names like Tollefson, Monk, or DeFever. I can now add Tolonen, Reid, Wahl, and Nakade to the list. The sun finally showed its face on the last morning, as 40 boats paraded out of the harbor. The largest was 90 feet; the smallest, 21. Each sturdy craft held mysterious stories of working days past. If one has pull from the sea running through one&apos;s blood, these intriguing boats should not be ignored. Come. Enjoy. Just be able to hold a pint or two.